​Rabbi Summit's book is the first in-depth study of the meaning and experience of chanting Torah among contemporary American Jews, describing how this ritual is shaped by such forces as digital technology, feminism and contemporary views of spirituality. He holds the appointment of Research Professor in the Department of Music and in the Judaic Studies program at Tufts University, where he also serves as rabbi and Neubauer Executive Director of Tufts Hillel. 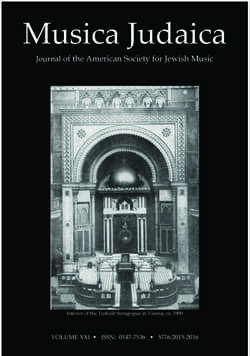 The programs of the Jewish Music Forum are free. ​To reserve you seat, please rsvp to info@jewishmusicforum.org. Your 2016-17 membership dues (Sept. 1 - Aug. 31) are an essential part of the funding that allows the American Society for Jewish Music to continue to operate. Membership dues support the annual Chanukah Concert and our contemporary concert Music in Our Time, among others during the season. The sessions of the Jewish Music Forum, both at home and "On the Road" are also supported by dues from members. And, importantly, the information and access we provide without charge to the St. Petersburg Score Collection, the Charlie Bernhaut Collection of Jewish and Cantorial Recordings, as well as a host of other activities and services which help keep Jewish music alive. You can join the Society, or to renew your membership online, or download the membership form and mail it in.